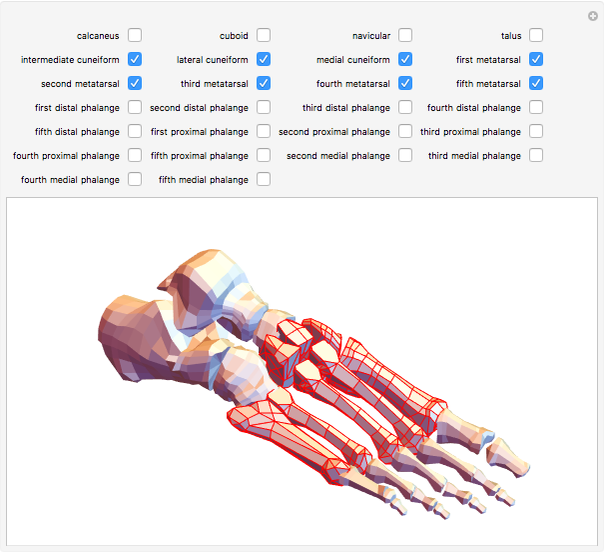 Select the bones of the foot by name to see them highlighted in interactive 3D graphics. Use this as an aid in learning the names of the bones. 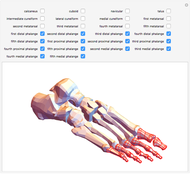 The big toe (or the hallux) has fewer bones than the other toes, and thus there is no first medial phalange. The original file was in Wavefront .OBJ format. 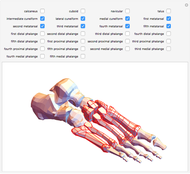 The following is the original legend from the file: Foot Bones # # Courtesy of: # # Viewpoint Animation Engineering # 870 West Center # Orem, Utah 84057 # (801)224-2222 # 1-800-DATASET # $ Contributed to the FTP site at avalon.chinalake.navy.mil (129.131.31.11) # by Scott R. Nelson of Sun Microsystems (srnelson@eng.sun.com) # # (c) Copyright 1992 Viewpoint Animation Engineering Inc. # Sun Microsystems has been authorized to freely distribute # these Datasets. They are provided for unlimited use in # existing or modified form. 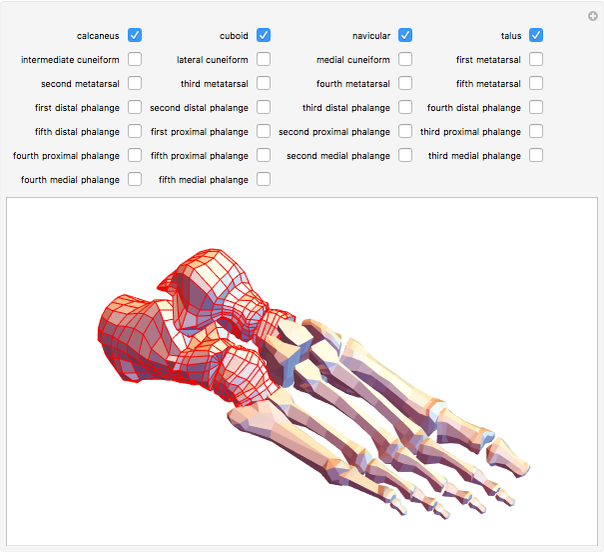 The actual Dataset (ie, geometry) # may not, however, be resold in existing or modified form. The original file contains 26 polygon groups, which are not separated by the Mathematica '.OBJ' importer. The polygon groups were separated by the author manually using a text editor ('vi'). See also the Foundational Model of Anatomy ontology. Stewart Dickson "3D Skeletal Anatomy of the Foot"